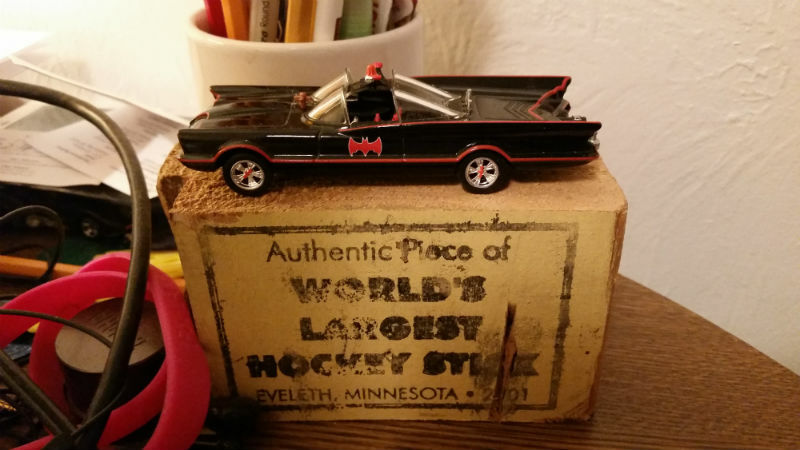 As our smaller Christmas rolls along, I’ve been trying to post some things that our five or six regular readers haven’t heard here before. Today, we have another. Arriving fresh within the hour is a cool gift from our friend Derek over at the faaaaaaabulous Derek’s Daily 45. When not disguised as Derek, mild-mannered curator of obscure but wonderful ’60s and ’70s R&B and soul singles, he’s one of the movers and shakers behind the Bang Girl Group Revue, which is indeed super. 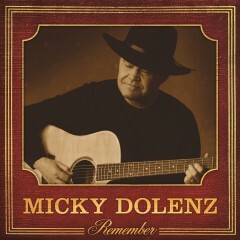 Three female singers, including Derek’s lovely wife Angeline, are backed by a four-piece combo led by Derek on guitar. Delightful throwbacks all. The Bang Girl Group Revue is just out with its first LP, “Soul Shangri-La,” which is chock full of throwback originals and nice covers. My red vinyl copy from the sold-out limited pressing arrived the other day, making its way from the San Francisco Bay Area to our corner of Wisconsin. Did I mention it’s on red vinyl? The gift that arrived from Derek today is this acoustic version of a Christmas soul classic. “(Christmas) Baby Please Come Home,” the Bang Girl Group Revue, 2012. Free digital download. Because this is Derek’s gift, and not mine, only the audio is presented here. “It’s meant for sharing,” Derek assures me. So to grab the free download and to get the story behind this wonderful cover, please head over to Derek’s Daily 45. It’s worth the short trip. Last Saturday night, my friend Mike and I plopped ourselves into lawn chairs on the 400 Block, the downtown square in our hometown of Wausau, Wisconsin. We cracked open a couple of Point beers and kicked back to listen to some tunes. We have been friends for 40 years. Back then, we spent a fair amount of time with a radio nearby, either for Brewers baseball or simply for tunes. Not much has changed for either of us. 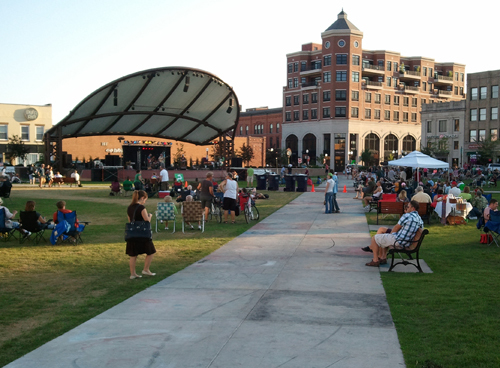 It was a delightful evening at WhyNotWausau, made even more so by great friends, great weather and a tremendous performance by The Right Now, a Chicago pop-soul-R&B group that’s on its way up. Ever since my friend Heavy Soul Brutha Dave tipped me to The Right Now two years ago. I’d been hoping for a chance to see what Dave described as their “old-skool Memphis feel” and “neo-soul vibe.” Couldn’t make their Summerfest gigs in Milwaukee. Couldn’t make a couple of Madison club dates. It was well worth the wait. Nothing written here will adequately convey the energy and the bigger-than-expected sound of The Right Now’s live show, from lead singer Stefanie Berecz to all the gents in the band. I have both of The Right Now’s albums, and it was as if my records exploded. A most pleasant surprise after the show was having guitarist Chris Corsale come up and introduce himself as we waited in line to say hello. That never happens. I’d exchanged notes with the band on Facebook, and Chris recognized me from there. He introduced us to Stefanie, who is as genuinely nice off stage as she is scorching on stage, and to Brendan O’Connell, who plays keyboards and guitar. Now we just gotta figure out a way to get them to play Green Bay, which does not have a cool venue like the 400 Block or a cool club that would be suitable. 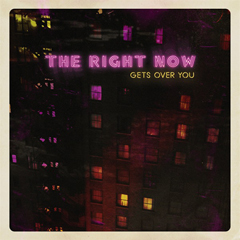 “Half As Much,” The Right Now, from “Gets Over You,” 2012. Head over to their website and grab the free download of the song. Also please enjoy the video for “He Used To Be,” which was a Record Store Day single but is not on the LP. If you dig this tune, I have an extra copy of the 45. Hit me up with an email if you’d like it. First come, first served. Please visit our other blog, The Midnight Tracker, for vintage vinyl, one side at a time. We don’t have HBO, so I didn’t have an opportunity to see the Martin Scorsese documentary on George Harrison when it aired last October. I’d heard good things about it, but knew I’d have to see it another day, another way. About a month ago, a most unexpected second chance came along. « Having grown up in the time of the Beatles and having come of age in the time after the Beatles, this is a familiar story. There weren’t many revelations, at least for me. A younger person will see it differently. Regardless, the film is exceptionally well done, thorough and thoughtful. « It’s interesting to be reminded of how Harrison got into movies, footing the bill to make the Monty Python troupe’s “Life of Brian” in the late ’70s. Less interesting, almost immediately, is a digression into the controversy over the film, which was seen by some as blasphemous. « Harrison’s spiritual quest is a fascinating thread woven throughout the film. His widow Olivia, who co-produced the film, provides an astonishing account of the scene at his passing in November 2001. « The music in the film — and there is plenty of it — brought a bittersweet realization. 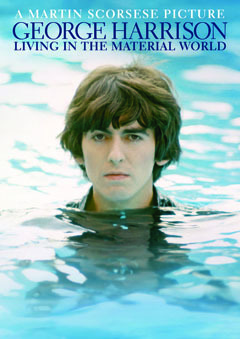 My knowledge of George Harrison’s music is wide but shallow. I know all of the hits, from the Beatles to his solo years to the Traveling Wilburys. But some of the songs in this film, no doubt familiar to many of you, were new to me. I somehow have missed out. I need to go out and buy some more George Harrison records. Your recommendations are welcome. The film’s companion CD is a start, and for that I am grateful. It features seven demos and three early takes of Harrison’s songs, all never before released. This is one, a demo prominently featured in the film for obvious reasons. 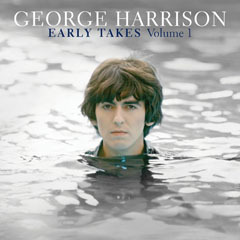 “All Things Must Pass,” George Harrison, from “George Harrison: Early Takes, Volume 1,” 2012. This was recorded in June 1970. At 4:40, this demo version is almost a minute longer than the finished version on the LP of the same name. Full disclosure: I received copies of the film “George Harrison: Living In The Material World” and the music CD “George Harrison: Early Takes, Volume I.” for review purposes. I promised only to watch and listen. I did not promise, nor was I asked, to say nice things.